This time of year, we literally get to enjoy the fruits of my husband’s labor. He is an apricot breeder, which means that throughout the short and intense season in May and June, quickly ripening apricots overtake our kitchen counters and refrigerator shelves and drawers. We eat them fresh, of course, but there are so many that we also make tarts and jams and share bag-loads of apricots with anyone willing to take them. If you lived nearby, I would share apricots with you, too. I hate to throw them away. If you are not an apricot fan, it may be because you have never had a great one. Even in Mediterranean climates, where apricots thrive, good ones can be hard to come by. They do not tend to travel well, and if they don’t turn mushy in the trunk of your car on the way home, one day in a warm kitchen will do the trick. But if you can get your hands on a great apricot, and you are not already an apricot fan, one bite may convert you as it did me. A great apricot threatens to overpower the senses—the charming red blush on the skin, the sunny orange flesh, the floral and sweet yet enticingly tart aroma and flavor. I discovered this fact relatively late in life, after moving to Spain. In fact, I cannot remember any apricot before this time that left any impression on me at all besides the “Apricot” doll from the Strawberry Shortcake collection. Even though I have accumulated far more delicious apricot memories in the nine years I’ve lived in Spain, I nevertheless think of Apricot every time I step into my kitchen this time of year. What did they ever put in her hair to make such an indelible scent? For my son, it will be a different story. Apricot was one of his first fruits, and his papá’s apricots will be one of his earliest food memories. Perhaps someday he’ll long for this taste of his youth. I hope you can sink your teeth into some great apricots this season. And if they ripen a bit too much, do not fret, make a tart! The tart pictured below, Verlet’s Apricot Tart from Patricia Wells, is one of my favorite ways to enjoy and share the season’s bounty. This is of course a French tart—in Spain, the most traditional way to eat apricots is the way you see my son eating his in the photo above. But since I began making it eight years ago, Verlet’s tart has become a perennial crowd favorite among my Spanish family and friends. Baking intensifies the tartness of the apricots, which complements the sweetness of the buttery crust. With a dash of almond extract and a sprinkling of ground almonds, this pastry also takes brilliant advantage of the affinity between apricots and almonds, two stone fruits in the same genus (Prunus). With so many new memories, the scent of apricots in my kitchen grows richer every year, evoking so much more than a fragrant childhood doll. Since I follow the online recipe more or less to a tee, I have provided a link rather than writing up the recipe here. The only modification I make is that I do not add almond extract to the filling, because I find the bitter almond taste stands out too much. But I do love the subtle flavor that the ground almonds add to the cream. If you cannot get good fresh apricots, this tart is also delicious with peaches. What are your favorite apricot recipes? I’m always looking for more ways to use them ;). If I had to capture early spring in Murcia in just a few words, fava beans would have to be among them. In the markets, woven baskets overflow with tangles of bright green fava bean pods. Shelled, the beans make their way to the table in a variety of traditional dishes, from omelets to stews to sautés. Many locals like to snack directly on the raw beans, which are firm and slightly bitter. This time of year, it is not unusual for restaurants to drop a handful of pods on your table to peel and enjoy like peanuts. Growing up in Florida, fava beans were not on my culinary radar. But since I moved to Murcia nearly a decade ago, I have come to love this legume—among the most ancient Mediterranean crops—in all of its guises. Every year, I particularly look forward to making this early spring stew, inspired by a similar recipe in one of my favorite Spanish cookbooks, The New Spanish Table by Anya von Bremzen. The stew is loaded not not only with fresh fava beans, but also artichokes, another of my favorite vegetables at their prime in early spring. Sherry and serrano ham give the dish a decidedly Spanish flair. As the name “stew” suggests, this is not a flash-cooked affair. Instead, the vegetables simmer until tender with garlic and onions in a rich, ham-infused broth. Raw garlic and parsley pounded to a paste and stirred in before serving add bright speckles of spring green and a lively garlic kick. When using fresh fava beans and artichokes, this is not a quick recipe—there is a lot of paring and shelling to be done. But your time will be rewarded. If you have young children in the house, shelling fava beans is a perfect task for little hands. In fact, my four-year-old son loved the work so much that he got mad at my husband for shelling too quickly and claimed the final handful for himself! I haven’t actually tried the stew with frozen artichoke hearts and fava beans, but I’m sure that’s delicious, too, if you cannot get the ingredients fresh. Von Bremzen suggests fresh or frozen peas or soybeans as a fava bean substitute. Von Bremzen’s recipe also calls for green beans and potatoes, but I wanted to focus on my favorite ingredients, so used more artichokes and fava beans and left these other vegetables out. She has you do all of the prep work in advance, but I like to prepare the artichokes while the onions are slowly cooking with the ham to streamline the process a bit and to give the onions richer flavor. Enjoy this early spring stew as a tapa, side dish (it’s excellent with fish) or light meal, with bread, of course! Cook the shelled fava beans in a pot of salted boiling water until they are just tender, about 4 minutes, depending on their size. Drain the beans and run them under cold water to stop the cooking process. Once the fava beans are cool enough to handle, gently press them between your fingers to pop the tender green centers out of the skins. Set the beans aside. Meanwhile, heat the olive oil over medium heat in a large pot. Stir in the onions and diced ham and reduce the heat to low. Let the onions slowly cook, stirring occasionally, while you prepare the artichokes. Reduce the heat to very low if the onions begin to brown. Fill a medium bowl with water and squeeze in the juice from the lemon. Clean and quarter the artichokes (here are some excellent instructions), dropping the quarters into the bowl to prevent browning. Since the stems are also delicious when cooked, I like to peel them and leave a 1- to 1 1/2-inch tail. When the artichokes are ready, the onions should be soft and beginning to turn golden (it took me nearly 30 minutes to prepare the artichokes – I’m slow). Stir in half of the garlic and the artichoke quarters. Reduce the heat to low, partially cover the pot and cook, stirring occasionally, until the artichokes have begun to soften, about 10 minutes. Add another tablespoon of olive oil if the pot seems dry. Pour in the sherry and increase the heat to high. Cook the sherry for about 1 minute, allowing it to reduce slightly. Add enough chicken broth to just cover the vegetables and bring the liquid to a simmer. Cook the stew over low heat, partially covered, until the artichokes are completely tender, about 20 to 30 minutes, depending on their size. Add more broth as needed to keep the artichokes barely covered. Once the artichokes are done, add the fava beans and cook until they are tender, about 5 more minutes. Place the parsley and remaining garlic in a mortar and pound them into a paste using a pestle. A pinch of salt can help. Stir the paste into the stew and cook for another minute to allow the flavors to blend. Season with salt and pepper to taste and serve warm. Spring in Murcia has begun with a cold north wind, but I still feel summer breathing down my neck. Come April, suffocating heat could appear any day, robbing us of a proper spring. It happens every year. The pressure is on to crank up the oven and bake and roast as much as I can while I still appreciate the added warmth in my kitchen. This is a perfect time to make escalivada, one of my favorite foods in Spain. Simple, versatile escalivada—a roasted Mediterranean vegetable dish of Catalan origin—is cherished throughout the country. It can be a salad, a side dish or a condiment, and it pairs perfectly with other Spanish favorites like jamón and tortilla de patatas. The exact composition can vary, but most versions of escalivada (sometimes spelled escalibada) contain roasted red peppers, eggplants and onions; tomatoes and garlic are other popular additions. In Catalan, the name escalivada means cooked over a flame or embers, the traditional means of making the dish. In fact, purists argue that the only way to cook escalivada is over fire, and that the dish is missing something essential without the smoky flavor the flames impart, although many home cooks make a respectable escalivada in the oven. As an apartment dweller myself, I say that a delicious oven-roasted escalivada is far superior to no escalivada at all. One of the best things about escalivada is that it is a cinch to prepare. To make an indoor version, you simply place your vegetables in a hot oven on a baking sheet and forget about them for an hour or so, removing them when the heat has done its work to make them ultra-tender and sweet on the inside. The hardest part (let’s not get too lazy here) is peeling the vegetables once they are cool enough to handle, removing any seeds and tearing the tender insides into thin strips. Minimal dressing is all you need to enhance the natural flavors—a sprinkling of fine sea salt and a generous drizzle of the most flavorful extra virgin olive oil you have. The result is a jammy escalivada that you can eat throughout the week in a number of different guises, if you make a large enough batch. 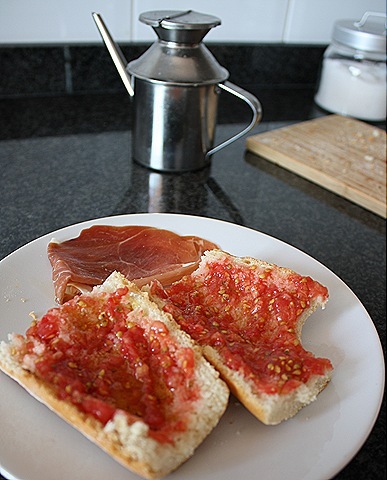 Alone, escalivada is excellent with fish or meat (or jamón) or simply for dunking bread. You can also eat it as a main-dish salad, topped with fillets of high quality olive-oil packed tuna and some black olives. Or use it on flatbread or pizza, or chopped up and mixed with eggs to make a veggie-packed Spanish omelet or scramble. You get the idea. One of my favorite ways to eat escalivada is on toasted country bread with anchovies, whose saltiness beautifully complements the sweet vegetables. If only I’d made more….Well, there’s always next week, as long as the north wind continues to blow. I have come across two different approaches to roasting the vegetables for escalivada in the oven—the minimalist approach, i.e., roasting the vegetables uncovered on a baking sheet (parchment-lined or not) and the slightly-more-involved approach, i.e., brushing the vegetables lightly with olive oil and wrapping them individually in aluminum foil before placing them on the baking sheet. I have tried both and have to say I like a blend of both methods. I preferred the red peppers and eggplants roasted uncovered and the onion brushed and wrapped, because the onion gets tender more quickly this way. I have written the recipe accordingly, but I recommend trying the different methods yourself to see which you prefer. The quantities are also subjective. I particularly love the sweetness of the red peppers in this dish, so used three big ones, but, of course, feel free to adjust the amounts according to your taste, what looks good at the market and how much space you have on your baking sheet (my oven in Spain is smaller than most ovens in the US). When adding garlic, keep in mind that the flavor will intensify over time if you have any escalivada left over. As for the sizes of the vegetables, I like to use smallish eggplants, which I find have a sweeter flavor, and small to medium onions, which don’t take forever to roast. Preheat the oven to 400ºF (200ºC). Line a baking sheet with parchment paper. Rinse and dry the vegetables. Place the red peppers on the baking sheet whole. Pierce the eggplants with a fork and place them on the baking sheet. Lightly brush the onions with olive oil, wrap them in aluminum foil and place them on the baking sheet. Bake the vegetables until they are collapsed, completely tender (check the eggplant and onion by piercing with a fork) and charred in places. In my oven, this took about 45 minutes for the eggplants and peppers and about 1 ¼ hours for the onions. When you remove the peppers from the oven, place them in a covered bowl or in a sealed plastic bag for 15 minutes to allow them to steam, making it easier to peel them later. When the peppers are cool enough to handle, peel them, remove the seeds and cut or tear the flesh into thin strips, working over a bowl to catch the juices. Peel the eggplants and cut or tear them into strips similar in size to the pepper strips. Finally, peel the onions and slice them into strips. Arrange the vegetables in a single layer on a serving plate, either by type or alternating rows. Tuck the garlic slices between the layers, drizzle everything generously with olive oil and season with salt to taste. Allow your escalivada to rest for 30 minutes at room temperature so the flavors can develop. If you store your escalivada for any longer, be sure the vegetables are covered with olive oil, cover the dish and place it in the fridge. Allow the escalivada to come to room temperature before serving. In many places, tomato salad is a symbol of summer—of warm, sunny days and cool, refreshing meals. But in Murcia, tomato salad is a year-round treat. And I do not mean salad made with the nondescript, greenhouse-produced tomatoes that can be found in Spanish markets even in winter. I’m talking about the ensalada murciana (Murcian salad), yet another genius combination of Mediterranean pantry staples that is made, not with fresh, but with canned tomatoes, which are tossed together with oil-packed tuna, onions, hard-boiled eggs, cured olives, and, of course, a good glug of extra virgin olive oil. Why Murcian salad? As is the case with many local dishes, it is impossible to pinpoint the exact origin, but the salad has been ubiquitous for long enough to take on the name of the city itself. This makes sense, because tomatoes (both fresh and canned) are emblematic of the huerta, the fertile lands within and surrounding Murcia that have long been recognized for their agricultural potential—traces of Roman irrigation systems have been discovered in the area, which were expanded and improved upon by the Arabs who founded and ruled the city for centuries. Tomatoes of course came later, brought back from the Americas in the 16th century. 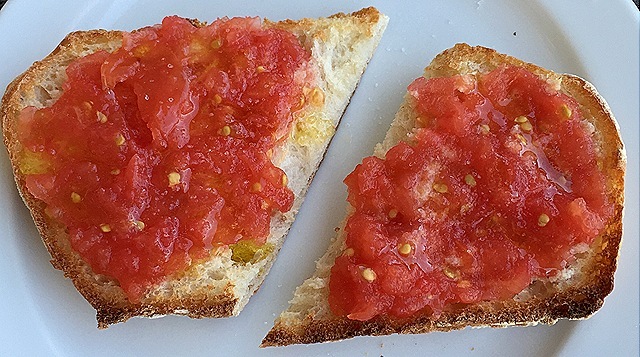 Tomatoes thrive in Murcia’s huerta, so it is logical that canning eventually became an important local industry, too. I love the tomato-packed ensalada murciana because it is easy to make and can be thrown together in any season. Served chilled in the summer, it refreshes like gazpacho, and at room temperature in winter, it adds a splash of sun and sea (and Murcia) to the table. This salad can be served as a tapa or side dish, or as a light dinner or lunch. It improves as it sits, so should be made at least an hour (and up to a day) before you plan on serving it. Most home cooks and bars toss all of the ingredients together, which of course helps the flavors meld. Yet some high-end restaurants artfully arrange their top-quality tomatoes, tuna, olives and eggs on a plate and then sprinkle them with sea salt flakes and drizzle the olive oil over the top. This is a good option for luxury canned tomatoes and tuna, where you really want each ingredient to shine. The steps here are just basic guidelines, because it really doesn’t matter what you add first (or how much you add) to the bowl. Feel free to improvise as they do here in Murcia, as all of the quantities can be adjusted according to your preferences or what you have on hand. Soak the thinly sliced onion in a bowl of ice water for ten minutes to make it easier to digest. Drain and set aside. Roughly chop the tomatoes (I do this right over the bowl) and place them in a large bowl along with their juice. Break up the tuna and add it to the bowl. Stir in the onions, chopped eggs and olives. Add salt to taste (I don’t tend to add much, since the tuna, tomatoes and olives already contain salt). Drizzle as much olive oil as you want over the salad and then toss everything together. Cover and chill for at least one hour before serving for the flavor to develop. Remove the salad from the refrigerator at least 15 minutes before serving (depending on the season) so that it is not ice cold (which dulls the flavors). In fact, in the winter, I prefer to eat ensalada murciana at room temperature. Serve with plenty of bread for dipping. Notes: The traditional olive used is a small, black (and brine-cured) Spanish variety called cuquillo. If you cannot find cuquillo olives, Niçoise olives are a good substitute. A quick note on the name change: This blog will no longer be called “go with curiosity,” but “Bread & Onions” instead, a more food-centric title. This new name comes from the Spanish food idiom, “contigo pan y cebolla,” “with you, bread and onions.” Briefly, this idiom conveys the same idea as the classic marriage vows “for better, for worse, for richer, for poorer.” More to come in my next blog post! 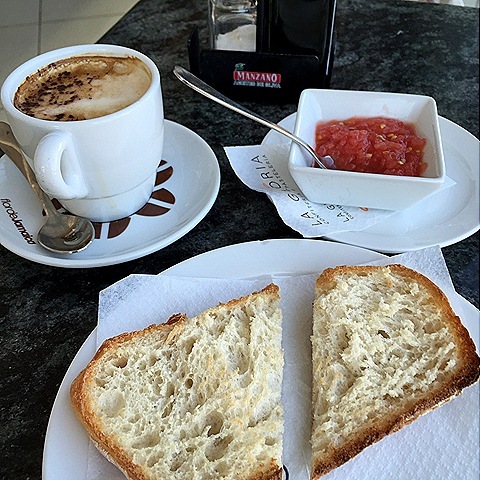 An introduction to Feeding Mateo: This is the first post in an ongoing series that will chronicle my experiences feeding a baby and toddler in Spain. I in no way pretend to speak for all Spanish babies. For one, I live in a provincial city, Murcia, which is quite different from living in a cosmopolitan capital like Barcelona or Madrid. Furthermore, Mateo’s diet includes a heavy dose of my own food memories and nostalgia. This is therefore my personal toddler feeding adventure in progress, rooted in a few essential ingredients: my Spanish husband’s traditions and family recipes; food ideas exchanged with other moms and dads I know on both sides of the pond; and my own “foodprints,”i.e., the flavors and food experiences I have collected in all the places I have lived and traveled. I also hope to hear ideas from readers who have either been there and done that or who also have a hungry toddler on their hands. Since I had Mateo, cooking is no longer the optional hobby it used to be. Before, I would often spend a full day (when I felt like it) preparing an elaborate new recipe that would provide me with leftovers for the rest of the week. Now, however, I must cook a wider variety on a more regular basis. I do not say this begrudgingly, as I obviously love to cook, but my relationship to cooking has certainly changed. Now I cannot wait for the muse to light the burners. Furthermore, I feel pressure to offer Mateo new flavors and textures to expand his palate beyond the typical toddler favorites (pasta, hot dogs, rice, anything sweet). At 28 months, Mateo loves to eat, although he is not one of those toddlers who will eat just about anything. In fact, he is going through a so-called picky phase. To give an example, he loves paella, although he has begun to suspiciously eye each spoonful for any stray bits of meat. If he finds one, despite my efforts to cut it into rice-sized pieces, he spits it out, saying disparagingly, “carne” (the Spanish word for meat). The only meat he will eat that is not chopped up into tiny pieces is jamón serrano, Spanish cured ham. Perhaps he’s destined to be a vegetarian, with an exception for Spanish jamón. In the meantime, however, I keep trying. One thing he never turns up his nose at is fruit. I often wonder if this is because the first “real” food he tried at five months old was a spoonful of fresh-squeezed orange juice, per his pediatrician’s recommendation. For the next several months of his life he got fruit every day for his merienda, his afternoon snack, in the form of papilla de frutas – a thick smoothie of blended fresh fruits like bananas, apples and pears, all with a squeeze of orange juice. The transition to pieces of fruit was seamless. Mateo happily devoured soft bits of ripe bananas and juicy melons and pears. He spent much of his first apricot season with a bright orange ring around his mouth (my husband is an apricot breeder and we get the most delicious apricots I’ve ever eaten, a topic which deserves its own post). 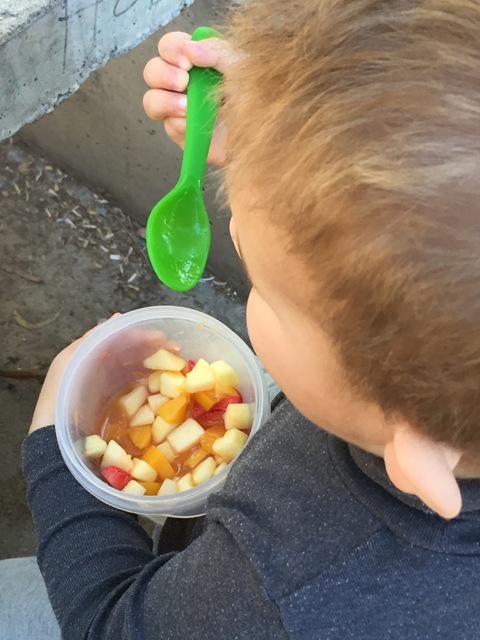 One of Mateo’s favorite ways to eat fruit these days is in a macedonia de frutas, a fruit salad. As he eats, we talk about the different fruits, colors and textures (“crunchy,” he often says to me when taking a bite of apple). When all the fruit is gone, he slurps up the juice from the bowl. At least I know with fruit I can never go wrong, perhaps thanks to that first sweet, juicy spoonful. The name of this diverse medley of fruits in Spanish (macedonia) is an allusion to the ancient kingdom of the same name under Alexander the Great’s (356-323 B.C.) rule. This vast empire stretched from the Mediterranean to India, encompassing many different cultures, races and creeds. While Alexander’s empire may not have been a harmonious blend, in the macedonia de frutas, all fruits are welcome. So my “recipe” here is just one example of the infinite possible combinations, depending on what your family’s favorites are and what’s in season. Bananas, pineapples, kiwis, berries, melons, you get the idea. Quality canned fruits make a nice addition as well. The version below is inspired by my friend Paz, whom I met in birthing classes at our local health clinic when we were both pregnant. 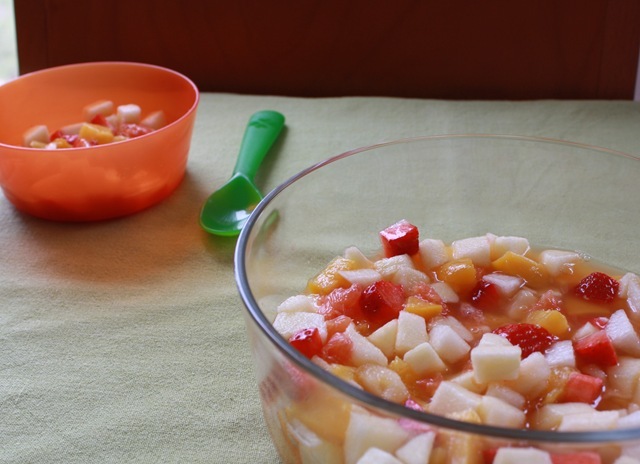 Just about every time we get our kids together for an afternoon snack, Paz makes a delicious macedonia de frutas. The other week, her salad included high quality canned peaches from Murcia and a bit of the syrup (Paz is from the Murcian town of Cieza in the main peach producing area in Spain). I (and Mateo, too, of course) liked the added sweetness of the canned fruit, making for a special treat. Serves 2, although the recipe can easily be doubled, tripled, quadrupled, etc. Wash and then cut up all the fruits, except for the oranges, into uniform bite-sized pieces. I tend to peel the apples and pears, but this is not a necessary step. Sometimes I add in bits of orange sections with the membranes removed, too. Squeeze enough orange juice into the salad until it nearly covers the fruits, removing any seeds of course. Mix in a teaspoon or more of the syrup from the canned peaches if you would like some added sweetness. Allow the salad to sit at room temperature for at least 15 minutes so that the flavors can begin to meld. If you would like to serve the salad cold, cover with plastic wrap and chill in the refrigerator for at least 30 minutes. For guests, it is best to serve this salad on the same day, although I often happily polish of the leftovers on the second day, depending on the fruits (the apples, pears and peaches hold up better than the strawberries and bananas, for example). Summer tends to linger well into the fall in Murcia, and this year has been no different. The Segura River valley where the city is located heats up like a sauna in July and August and does not easily yield to cooler temperatures come September. Weeks after the fall equinox, highs in Murcia remained stubbornly in the 90s. Once again, it has been a veranico del membrillo – a quince summer. This expression, a version bearing the Murcianized diminutive –ico (in other parts of Spain, the saying is veranillo del membrillo), is the equivalent of an Indian Summer, when unseasonably high temperatures assert themselves in early autumn, just when ripened quinces are beginning to appear in the markets. Up until several years ago, I admittedly would not have known a quince had I seen one. This curious fruit was certainly not a Florida childhood staple, although it would not have been out of place on my grandmother’s New England table. In my mind, the quince evokes Colonial America and sensible Yankee desserts, preserves and ciders. Its roots, however, extend much further back. In fact, many botanists believe Adam and Eve’s Forbidden Fruit may have actually been a quince. Even if it was one day a sinful temptation, the quince nonetheless fell out of favor, at least in the US. Its irregular shape and hard and astringent flesh that must be cooked to be eaten made it an outcast in a grab-and-go world. Yet these are the precise qualities that have contributed to a quince renaissance in recent years. 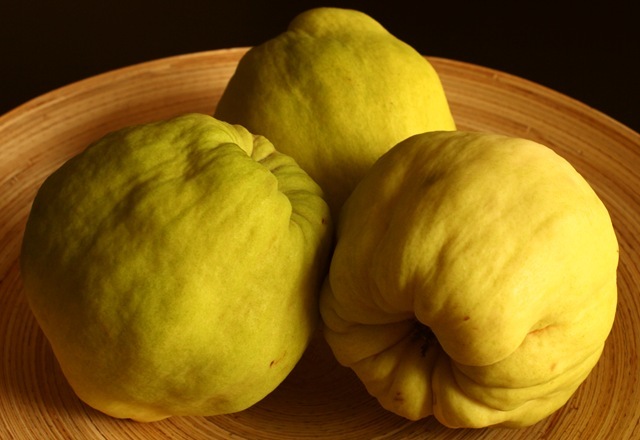 The humble quince has become a lovable poster child for champions of slow food and opponents of perfectly round fruits without character. In Spain, quince has remained relatively common over the years. 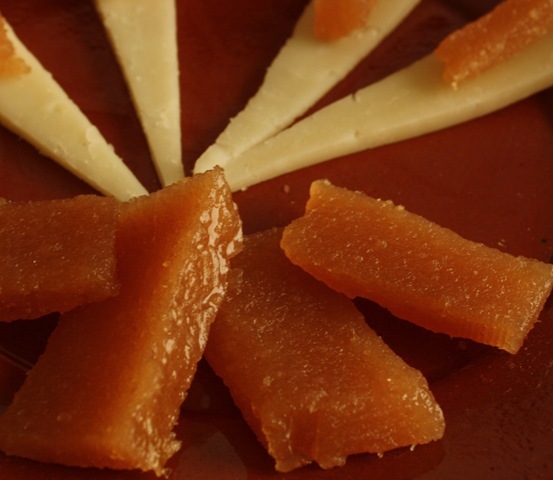 Here, it is typically cooked down with sugar to make concentrated blocks of dulce de membrillo, quince paste. Slices of the sweet jelly are the perfect foil to salty and tangy sheep’s milk cheeses like Manchego. 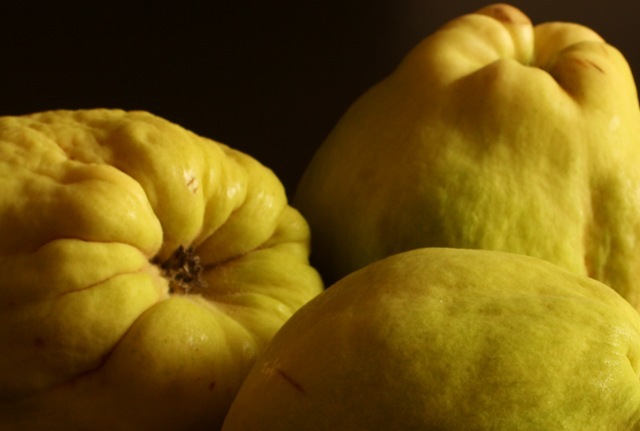 Quince became an important crop in Murcia in the Middle Ages under Arab rule, and centuries later contributed to the growth of the still significant canning industry in the city. Even though quince production has declined here over the last several decades (largely coinciding with the fateful construction boom), the fruit has not lost its power to conjure up hot fall days in the expression, el veranico del membrillo. Little by little, the seasons are indeed shifting. Murcia’s imposing summer has finally begun to give way, allowing crisper air to seep into the night, which the sun labors to chase away with dwindling strength. Yet if experience proves me right, the heat will return at least one more, prolonging the quince summer. Summer’s last stand calls for quince paste. Cooking down quinces into concentrated and sweet dulce de membrillo is a means to preserve the taste of warmer days for the inevitable winter to come. The basic steps of this recipe are relatively straightforward – peel and core the quinces either before or after cooking; boil until tender; puree the peeled and cored fruit; mix with sugar and cook over low heat until concentrated; then pour into a mold and cool. But, as I learned through trial and error, timing can significantly influence the results. Most recipes I came across in local Murcian cookbooks had a lot of gaps, presumably to be filled in with experience. For example, El Libro de la Gastronomía de Murcia suggests cooking the pureed fruit and sugar for 15 minutes, which was enough to make a tasty quince sauce (akin to apple sauce) but not enough to make a concentrated paste. I kept cooking and stirring for 30 minutes more and achieved satisfactory, and sliceable, results. I have since researched different cooking methods and have come across wildly varying simmer times, from 8 minutes to several hours. I am still experimenting to find the version I like best. In any case, far worse things could happen than to end up with a delicious quince sauce. I encourage you to visit Janet Mendel’s recent blog post on quinces for her complete and easy-to-follow recipe for dulce de membrillo. Mendel uses several techniques I am eager to try, such as adding some of the quince poaching liquid to the fruit puree and lining the mold with plastic wrap for easy removal. 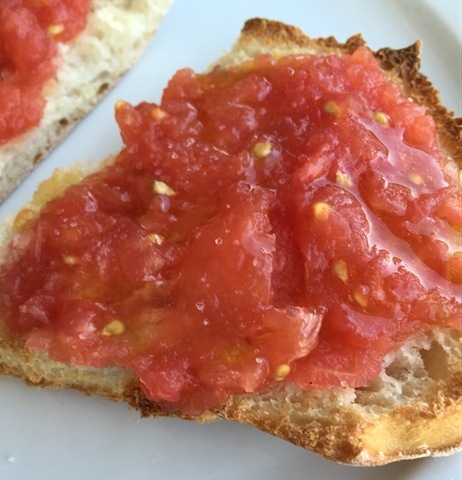 Mendel’s post also includes a lovely story about quince paste in Spain and a savory quince recipe with lamb inspired by several Mediterranean dishes. To determine the amount of sugar you need, measure or weigh the cooked and pureed fruit and add the same quantity of sugar. I used three quinces, which was enough to fill a 5.5 x 4.5 x 1.5 inch aluminum container. Cut the quinces in half and place them in a pot and cover with water. Bring to the boil, lower the heat and simmer until the flesh is tender and easily pierced with a fork, after about 30-45 minutes. Completely drain and, once the quinces are cool enough to touch, peel and core them. Puree the fruit, then weigh or measure it and mix it with an equal amount of sugar in a heavy saucepan. Cook over medium low heat until the puree is reduced nearly by half, stirring frequently so it does not stick to the bottom of the pan. Pour into a rectangular mold and cool. Properly concentrated quince paste will keep in the refrigerator for up to several months. Serve thinly sliced with an assertive cheese such sheep’s milk Manchego. 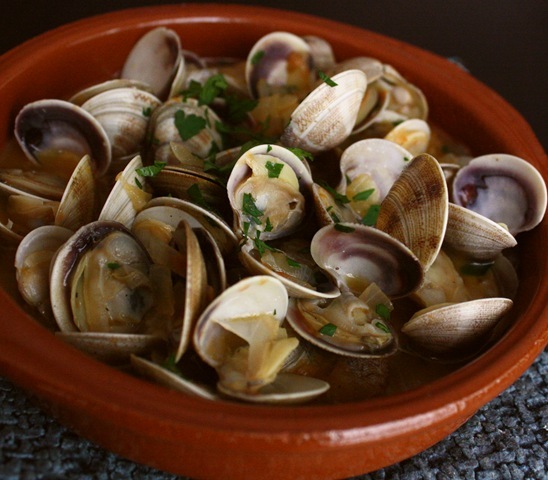 This classic Spanish tapa of clams simmered in a garlicky broth of white wine, olive oil and tomato brings the Mediterranean to your table. In each bite, you find brine from the sea and vibrant ingredients from the sun-soaked land. Almejas a la marinera, either with or without tomatoes, are served in coastal regions throughout Spain, including, of course, Murcia. Here, thanks to a long stretch of Mediterranean shore, fish and seafood figure prominently in regional cuisine. Marisquerías – bars and restaurants specializing in seafood – line the streets of Murcia’s beachside towns and are an essential part of urban food culture, too. On Fridays and Saturdays at midday, the best marisquerías fill up for the aperitivo, a serial feast of fish, prawns, calamari and various bivalves – think mussels, cockles and razor clams – either fried, steamed or seared a la plancha. Simple seasonings include olive oil, salt, pepper and perhaps a squeeze of lemon. Cold lager, the favored beverage, flows in an endless stream from tap to pitcher. At such gatherings, I always order almejas a la marinera, which are served in a communal dish, placed where everyone at the table or bar can reach. A film of the scene would capture a blur of hands picking up clams and dipping bread into the fragrant broth. In the background, we’d hear lively conversation, the crinkling of those thin paper napkins ubiquitous in Spain and the occasional rattle of empty clam shells hitting the floor. To me, this convivial way of eating almejas a la marinera is as important as the ingredients. Sharing the dish completes the recipe, merging the flavors and culture of the Mediterranean. Manolo’s mother Valen often prepares these clams as an appetizer for family lunches on Sundays. She serves them in a shallow dish, communal of course, and we all gather around the table and reach in. With pieces of bread, we make savory barcos (boats) by scooping up onion, garlic and broth. 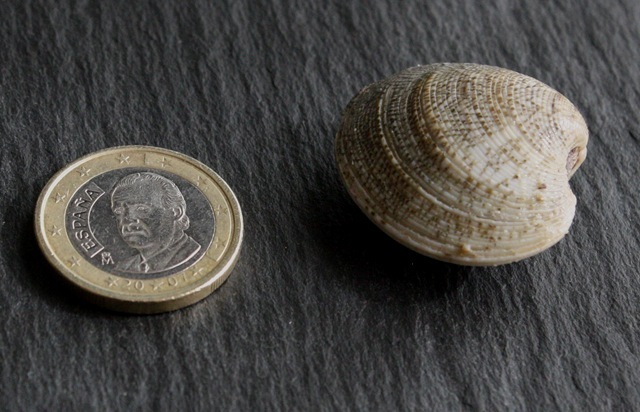 Mediterranean clams are small, slightly bigger than a one euro coin or quarter. I recommend using the smallest clams you can find for this recipe. I have come across several slightly different methods for removing grit from the clams before cooking them. Here, I have included Valen’s method, which you will need to start about 30 minutes before cooking the clams. You can make the sauce in advance and then reheat it and cook the clams at the last minute. This recipe can easily be doubled. And, of course, be sure to have plenty of good bread on hand for dipping. To remove grit, place clams to soak in a bowl with salted cold water about 30 minutes before cooking. Change the water three times, lifting clams out with a slotted spoon to prevent them from taking in any of the sand they have just expelled. Give clams a final rinse before adding them to the sauce. Heat olive oil in a skillet large enough to hold the clams in a single layer over medium heat. Add tomato and cook, stirring occasionally, until it begins to reduce, about 5 minutes. Add onion, garlic and ¼ tsp of salt and cook, stirring frequently, until the onion has softened and the tomato has lost most of its liquid, another 5-7 minutes. Stir in the flour and cook for another minute. Add water and white wine and simmer, stirring frequently, until the sauce has thickened (it will become more broth-like once the clams are added). Taste for seasonings, keeping in mind that the clams will add saltiness and depth of flavor. Add clams and cover, cooking over medium heat until they open, about 3 to 5 minutes. Discard any that remain closed. Stir in the parsley, then pour into a shallow serving dish. Serve immediately. NOTE: Grating is a quick and easy way to peel tomatoes, and is a favorite method of many Spanish cooks. Cut the tomato in half and gently grate over a bowl, flesh side-down, using the large holes of the grater. The tougher outer skin will not pass through the holes. 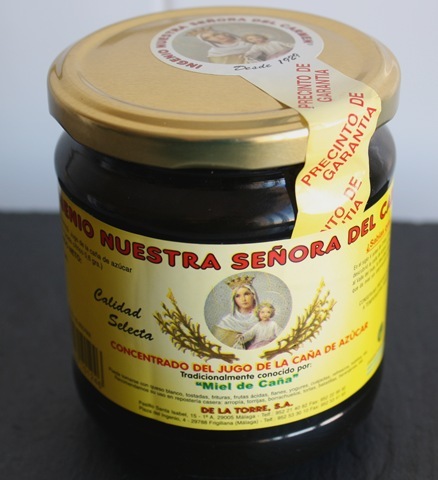 This post is dedicated to my friend Nacho, who inspired me to try this recipe, and who probably thought I had forgotten his request, as well as the jar of cane syrup his sister brought me from Córdoba (jar pictured below). Nacho – you will see why it has taken me so long. Thank you for the syrup, and the inspiration! 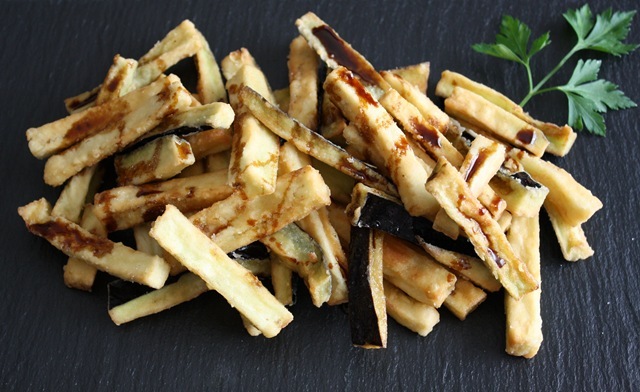 These addictive eggplant fries with Moorish roots are most commonly served in Andalucía. They appear in different guises (round and/or battered), but the basic premise is the same, and each enchanting bite is crisp, tender, salty and sweet all at once. The dark cane syrup, akin to molasses, has a slightly bitter edge, which keeps the sweet interesting. Manolo and I quickly devoured this plateful as an accompaniment to roasted fish for a non-traditional Thanksgiving feast, and boy was I thankful I had dared to try the recipe. This was a test, you see, for my newfound frying mettle. The truth is, I used to be afraid of frying. My family never did much if any, and as a result, the process seemed mysterious and challenging. How much oil should I use? And how would I know when it had reached the proper temperature? Recipes with instructions to use a thermometer only upped the anxiety. This made frying sound so technical, and, as a result, even more intimidating. 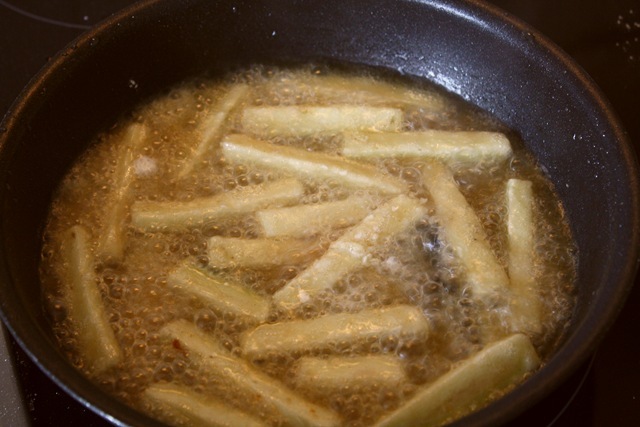 Yet in Spain, frying is a basic technique for most home cooks I know, which has helped make the process seem far less mysterious. By now, I have watched Manolo’s mother Valen fry potatoes countless times, gleaning a bit of the frying intuition she has acquired through years of experience. She has never used a thermometer, and instead, relies on the look and smell of the oil. It’s ready, she says, when the surface begins to stir and the oil is fragrant and just starting to smoke. Sensing I didn’t fully trust my eyes and nose, Valen also taught me a local trick to test the oil’s temperature, using a curl of lemon zest. When the zest sizzles and begins to brown, she told me, the oil is hot enough for frying. I find this thermometer-free approach gives me confidence. It will be a while before my inner sensor is as reliable as Valen’s, but it has definitely matured. 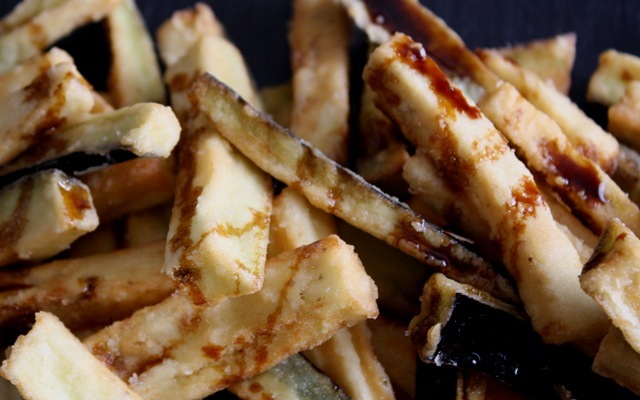 And as they say, the proof is in the pudding, or, in this case, in the eggplant fries. I consulted a number of recipes in both English and Spanish to write this version, and am particularly indebted to Claudia Roden for her Eggplant Fritters with Honey in the The Food of Spain, as well as to Anya von Bremzen for her Eggplant “Fries” in The New Spanish Table. Several recipes I read suggested soaking the eggplant for one hour before frying to minimize absorption of oil. I tried soaking in beer, as recommended here, and in milk, as Roden recommends. I preferred the milk. The beer-soaked fries seemed slightly more bitter (but still a delicious vegan option), although I did use different eggplants, so my results are far from scientific. First dredging the eggplant in flour also reduces oil absorption. And the frying itself? Well, knowing what to look for and trusting your senses, there’s really nothing to be afraid of. In the tapas spirit, you can serve these fries with just about anything. I think they go particularly well with roasted meats, like chicken and lamb, or fish. Add a green salad, and you’ve got what I’d call the perfect meal. The quantities here are for two people, but the recipe can easily be doubled. Cut the eggplant, peeled or unpeeled, into slices (about 2 1/2” long and 1/3” thick). Soak the sliced eggplant in a bowl of milk (or beer) for 1 hour. Weight slices down with a plate so they are fully submerged. Meanwhile, place a generous amount of flour (about ½ – ¾ cup) on a dinner plate and mix with a pinch or two of salt. When you’re ready to fry, drain the eggplant slices and dredge them in the flour, shaking off any excess (I did this with my hands, letting the flour fall between my fingers back onto the plate). Set the floured slices aside on a separate plate. Line another plate with paper towel for post-frying. Heat oil, poured to a depth of about 1 inch, in a deep skillet over high heat. (I used a 9-inch skillet and fried in three batches.) When the surface of the oil begins to quiver and starts to smoke, test a floured eggplant slice. If the oil sizzles right away, that means you’re ready to fry. 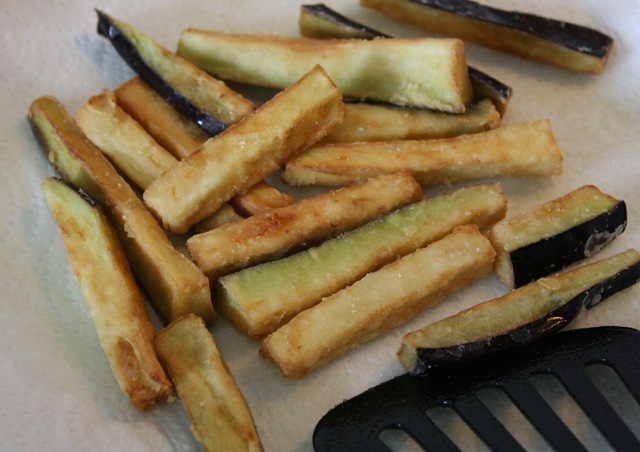 Add a batch of eggplant slices, being careful not to overcrowd the pan, and fry, stirring occasionally, until golden, about 3-5 minutes. Reduce heat to medium-high if the eggplant is browning too quickly. Remove with a slotted spoon and place on the paper towel-lined plate to eliminate excess grease. Sprinkle with fine sea salt to taste. Place on a serving plate and drizzle with fine ribbons of cane syrup or honey. **NOTE: While you can use your choice of oil for frying (like canola or sunflower), the authentic recipe of course calls for olive oil. (See Janet Mendel’s comment on this post). I really couldn’t believe that such a flavorful and satisfying dish made with everyday Mediterranean ingredients was not as well-known around the world as its more famous Andalusian cousin, gazpacho. Salmorejo, thickened with a good dose of bread, is richer and denser than the more vegetable-packed (and delicious in its own right) gazpacho, which is more like a salad in comparison. 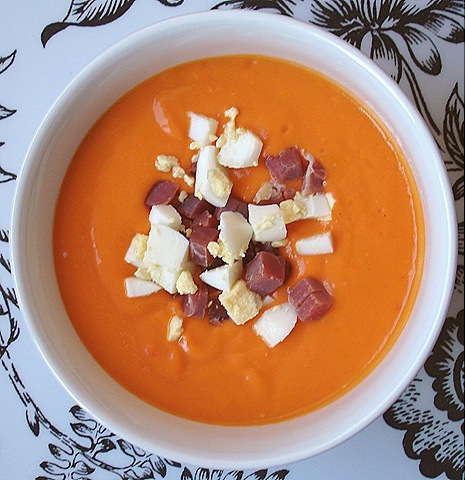 Topped with diced egg and serrano ham, salmorejo can easily be served as a main dish, even for hearty appetites. This soup has never failed to surprise and delight friends and family at home in the States. The bright salmon color engages the eyes; the cool, silky texture pleases the tongue; and the fine balance of flavors – the zing of garlic and vinegar, the sweetness of tomatoes and peppers, and the saltiness of ham – intrigues the taste buds. I have come to crave salmorejo when the temperatures in Murcia begin to soar, and throughout the summer as tomatoes continue to ripen on their vines. Although the flavors and sensations are now familiar, each new spoonful sings with the revelation of the first. This recipe is all about minimal fuss – you roughly chop the ingredients, and then let technology take over. Many salmorejo recipes I have come across call for peeling and/or seeding the tomatoes, which I’m sure is delicious, too, but really isn’t necessary if you have a powerful kitchen machine (while there may not be anything out there as mighty as the Thermomix, as I wrote in my last post, a good blender or food processor will work, too). Drop the garlic cloves, tomatoes, red pepper and salt into a powerful blender or food processor and blend until smooth (if all the tomato and pepper does not fit at first, simply add as you go). Then add the bread and the vinegar and, once again, blend until smooth. With the motor running at medium-low speed, gradually pour in the olive oil and whiz until emulsified. Adjust the vinegar, olive oil and/or salt if desired. At this point, the soup should be velvety smooth (almost foamy) in texture. If it is not, keep blending away. Pour the salmorejo into a large bowl, cover with plastic wrap and refrigerate until cold, at least two hours and up to overnight. Serve garnished with the hard-boiled eggs and diced serrano ham if using. Check out another recipe for salmorejo including almonds in this August article in Bon Appétit – it seems word is getting out!